Home Categories Vitamins & Supplements Wee-Wee Disposable Diapers - 12 ct.
Wee-Wee Disposable Diapers - 12 ct.
Wee-Wee Disposable Diapers are designed for pets with incontinence or excitable urination, untrained puppies, and female dogs in season. Four Paws Wee Wee Diapers are highly absorbent and, like diapers for infants, "wick away" moisture from skin/fur. 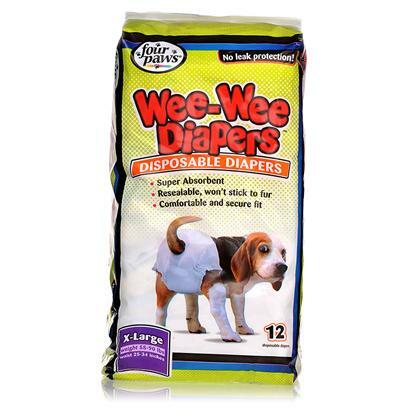 These comfortable & leak proof diapers are available in 5 sizes to fit almost any dog. See packaging for complete size chart and instructions.